Welcome to the web page of St Fin Barre’s Lodge No. 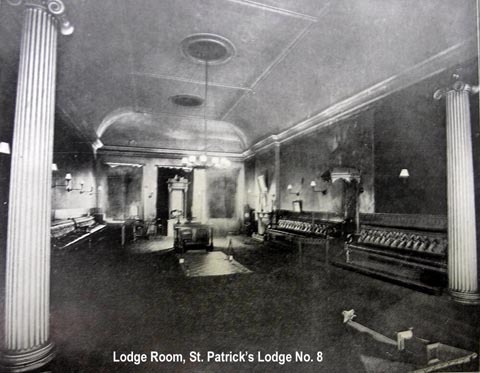 8, a Lodge which was formed by the amalgamation of St Patrick’s No. 8 and St Fin Barre’s No. 209 in 1997. As you can see, a compromise was made between the Lodges where the number of one and the name of the other made up the new lodge. In common with many of the early warrant issues in Ireland, there is no record in the registers of Grand Lodge as to the date of grant of the original No. 8 warrant, but it was noted as meeting in the Eagle Tavern on Cork Hill, Dublin in 1735 (Smith, 1735), and by 1744 had changed venue to the Plume of Feathers Tavern in Castle Street (Spratt, 1744). This number was erased from the registers on November 5 1801 and, one would assume, the lodge worked continuously in the city of Dublin in the interim. But not so! The warrant was worked in the town of Youghal in the east of the county of Cork during the mid-eighteenth century, where in 1759, the Worshipful Master of the Eighth Lodge of Ireland was one Bro. Richard Croker. When lodge ceased working there is not now known, as the relevant leaves of the Grand Lodge records were torn out in the early nineteenth century, but something remains of this period in several of the officer collar jewels engraved Eighth Lodge of Ireland. Following a seven-year dormancy, the No 8 warrant was reissued on June 9 1808 to a group of brethren of the city of Cork under the title ‘St Patrick’s Lodge’, the first Master being John Wrixon, and the founding Wardens being Charles Ross, S.W. and Richard Notter, J.W. However, this trio and the other officers were not installed until eighteen months later, when the first meeting of the newly constituted lodge was held on emergency on December 12 1809. The lodge has worked continuously since, aside from a nineteen-month hiatus, lasting from July 6 1826 to February 7 1828, during which the warrant was cancelled. Since return to working on the latter date, it has met continuously, although not under the original warrant, it being noted in the minutes of March 16 1843, ‘the old one [is] lost … stolen in the post’. The officers for that year were installed under the First Lodge of Ireland warrant by permission, following a Grand Lodge dispensation, until a duplicate warrant issued. There are some interesting entries in the old minutes, one of which, dated July 19 1821, refers to the celebration of the coronation of George IV, when the lodge members processed in full Masonic dress to Christ Church, with the Mayor and Corporation, and from thence to the laying of the foundation stone of George’s Bridge – named for the King – over the south branch of the River Lee. 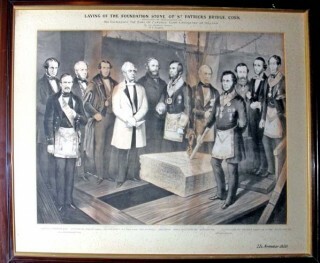 On November 10 1859, the brethren of Lodge No. 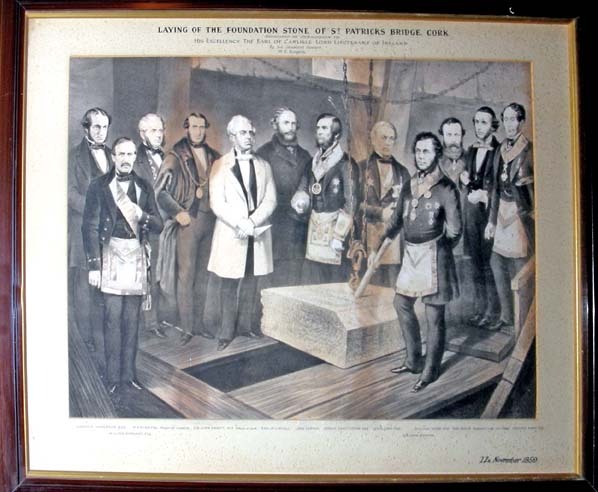 8, along with other Cork Lodges, were again in attendance at the laying of a foundation stone – that of St Patrick’s Bridge – in the presence of the Lord Lieutenant, a lithograph of which event hangs in the stairwell hall outside this lodge room. During the first half of the nineteenth century, Lodge No. 8 seems to have met in several different locations, initially in the residence of a Mr. George. On May 18 1823, lodge resolved to remove to the house of Bro. Giles Lee at The Crown Tavern, Austen’s Lane, which was no doubt more convivial! In 1824-25, they met in Mr. Leary’s house, and for the remainder of the 1820s, at the house of Mr. Wright, Merchant’s Quay. In 1830, lodge met in Bro. Sheehan’s in Warren Place [now Parnell Place, near the Bus Station], while a minute of January 13 1833 records a committee report ‘that the Imperial Hotel [South Mall] appears to be the best and most suitable place for Lodge No. 8 to remove to’. However, lodge did not remove there for several years, meeting in Lloyd’s Hotel during 1837, until a minute of November of that year resolved ‘that although we consider Mr. McDowell’s Ball Rooms [in the Imperial Hotel] which appear at present the only place that can be got, too large for the present members, that the Treasurer is empowered to pay a sum not exceeding £10 as our proportion of rent (other lodges also rented there) for one year, and Mr. McDowell be requested not to ask for the rooms on the first Wednesday of each month.’ No. 8 then commenced working in Mr. McDowell’s Ball Room – better known now as The Clarence Room – where lodge met for over six years until July 1844. This room continued to be of special significance to the lodge, both as a former meeting room, and also the location of the centenary banquet. During 1844, there was a period during which the meeting place was subject to frequent change; venues included the office of Bro. John Bennett, a room in the Victoria Hotel on Patrick Street, followed by a room above the Oyster Tavern. Towards the end of 1844, the premises known as No. 31 Maylor Street was secured on lease, and the first meeting was held there on November 18 1844. Almost immediately, No. 31 became the hub of city freemasonry, as the meeting place of not only Lodge and Royal Arch Chapter No. 8, but also several other Lodges and Chapters, and even Preceptories, as sub-tenants. 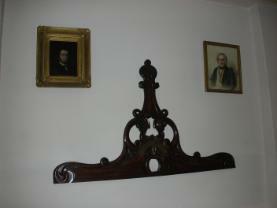 In 1850, a proposal of tenancy was received from Concord Lodge No. 71, followed in 1859 by Third Lodge of Ireland; these two lodges and their royal arch chapters were accepted as sub-tenants by St Patrick’s No. 8. The brethren of the province commenced assembly in large numbers from half-past eleven and, at noon precisely, the procession formed in the ante-room before proceeding slowly into the lodge room where the R.W. Provincial Grand Master then took the chair and was then duly proclaimed by the Provincial Grand Pursuivant by the following styles and titles:- ‘The Most Excellent, Most Illustrious and Right Worshipful Brother, General Sir James C. Chatterton, Baronet, Knight Commander of the Bath, Knight of Hanover, Sovereign Prince, Grand Inspector-General, 33rd or dernier degree, Provincial Grand Master of Munster’, after which the proceedings opened to solemn music on the harmonium, at the conclusion of which the Deputy Provincial Grand Master, George Chatterton Esq., J.P. took the chair and proceeded to open The Right Worshipful, The Provincial Grand Lodge of Munster in due and ancient form. The Worshipful Master of No. 8, Brother Francis Guy, then informed the R.W. Deputy Provincial Grand Master of the wish of the brethren of the Lodge that their Hall be dedicated according to ancient custom. Many individuals, indeed dynasties, of mercantile and professional prominence in both Cork and Ireland were in membership of Lodge No. 8, among them William Penrose (1809), whose family were timber importers, resident at Tivoli, and after whom Penrose Wharf and Quay in this city is named; Francis Wise (1811) and George Wise (1839) of the distillery family with premises on both the North Mall and in Blackpool – a member of this family paid for the building of one of the spires of St Fin Barre’s Cathedral; Joseph Austen (1832), Thomas Spering (1834) and Joseph Spering (1844), all scions of Cork wine mercantile dynasties; Thomas Dunscombe (1835), whose family purchased one of the islands in the river Lee in the seventeenth century, subsequently known as Duncombe’s Marsh and reclaimed it to form the Princes’ Street area of the city centre; Benjamin Deable (1839) of the milling and clock manufacturing dynasty; Francis Guy (1847) of the famous Guy & Company, Printers and Stationers of Patrick St. and Cornmarket St.; Thomas Dunbar (1847) of the family of millers who built Dunbar’s Mill in 1836, off George’s Quay and after whom Dunbar Street is named; Patrick Alexander Fitton (1882) of the legal and engineering family after whom Fitton Street is named; Ashley Cummins MD (1884) of the well known Cork family of physicians, resident in Glanmire and Patrick’s Hill. Perhaps the most famous members in this artistic genre were the Buck brothers – Frederick (1845) and Adam (1848), who made a profound contribution to the arts as miniature and portrait painters. The Buck family intermarried with the family of Olden, two members of whom Frederick (1844) and George (1849), merchants in Winthrop Street, were also members of No. 8 and, as such, were ancestors of R.W. Bro. Charles Olden, Grand Treasurer of Ireland and Past Provincial Grand Master of Munster. The early twentieth century brought with it the centenary year of the lodge, which was marked on May 8 1908 with a banquet in the Clarence Room of the Imperial Hotel, South Mall, marking a return to the former lodge meeting room. By this time, in addition to Third Lodge and Concord No. 71, a further three lodges and their chapters were renting as tenants of No. 8 at Maylor Street, namely Hibernian No. 95 (for a time in the 1870s, and again from 1900), St Fin Barre’s No. 209 (from 1918) and Quis Separabit No. 595 (from 1924), the Mourne Preceptory (until 1926) and, for a time, the Shandon Preceptory of High Knight’s Templar (1877-1913) also met in the building for the first three years of its operation, whereupon it removed to Tuckey Street, perhaps as part of a move to better define its separate identity. For over half a century, therefore, 31 Maylor Street was the meeting place for city Freemasonry. We are most fortunate to have a photograph of the interior in 1908, at the time of the centenary of the warrant coming to Cork. In August 1920, a valuation of the contents of the Maylor St. premises was undertaken by E.K. Kearney, Auctioneer & Valuer of 37 Marlboro St, who noted that it consisted of a Ground Floor Kitchen, Cloakrooms and Staircase Hall, and an upstairs Ante Room and Lodge Room and valued the entire at £1,024 18s. In 1924, however, when discussions commenced concerning the bringing together of all the city lodges and their associated groupings, it was resolved that all would be best served at 27 Tuckey Street, then the meeting place of First Lodge, Royal Arch Chapter No. 1, Provincial Grand Lodge, District Grand Royal Arch Chapter of Munster and Prince Masons Chapter No. 1, subject to the provision of additional capacity. The top floor was added during 1925, and the last Masonic meeting held at 31 Maylor Street took place on St John’s Day, December 27 1925. Since January 1926, Lodge No. 8 has met at Tuckey Street. 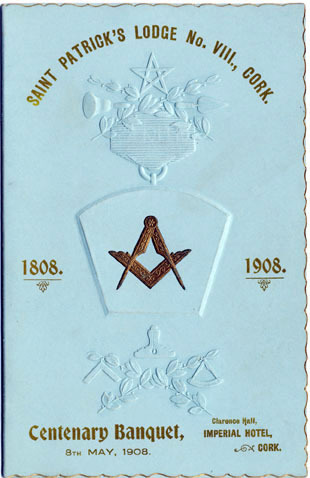 The membership profile of this lodge diversified further in the first half of the twentieth century. Famous families, landed and mercantile, continued to be numbered amongst its ranks, among them Captain R.B. Beamish (1909), Richard V. Jago (1939, Lord Mayor of Cork in 1957), and Colonel W.T. Hungerford (1939). St Patrick’s No. 8 retained ownership of 31 Maylor Street for a considerable period after vacating the premises at the end of 1925, and it proved a most valuable source of revenue from April 1928, when lodge decided to lease to the National Union of Railwaymen (N.U.R.) Club, who met there from May 1928 until December 1939 (having run into financial difficulties during that year). From February 1940, it became the Arcadia Ballroom, generating rental income of £125 per annum for the ensuing 25 years. In November 1950, it was proposed to sell the lodge leasehold interest in the building for £2,800, with all legal costs paid by the purchaser. This was carried into effect during 1951 and the old lodge room continued as a ballroom for many years; in the early 1990s, following a decade or more of disuse, it was demolished and the site incorporated into Roches Stores (now Debenham’s). Our Provincial Grand Lodge of Munster premises in Tuckey Street was fortunate to escape with only water and smoke damage when, in September 1970, fire spread to the top floor of an adjacent building, since demolished. These rooms were closed for fifteen months for renovation and, in the resulting confusion, some historic items became misplaced, such as the Georgian Silver Square, used in the opening and closing of this lodge. A member relocated it during 1979, during a visit to a Cork antique shop, still bearing its inscription; he purchased same and returned it to lodge use, September 11 1979. In 1997, following the reaching of agreement over a number of years between the membership of two of our city lodges, a union was arranged, whereby the warrant of ‘St Fin Barre’s Lodge’ No. 209 (constituted in 1918) was returned to Grand Lodge and a compromise reached in that its title was transferred to the lower number, and so the present ‘St Fin Barre’s Lodge No. 8’ came into being. But then it was not the first time a subtle name change had been undertaken by lodge, for as several of the officer collar jewel’s attest, there was the eighteenth century period during which this was known as The Eighth Lodge of Ireland. The Ceremonial Spirit Level used at the laying of the foundation stone of St Patrick’s Bridge (1859) and St Fin Barre’s Cathedral (1865), It is flanked on either side by portraits of two past masters of St Patrick’s No. 8 – that on the right is of W.Bro. Charles Ross, the founding Senior Warden of the Lodge. Legend has it that debts arising from the non-payment of his Installation Dinner landed him in gaol. He was released upon settlement in full. There is no record in the register of Grand Lodge as to the date of grant of the original No. 8 warrant, but it was meeting in the Eagle Tavern on Cork Hill in 1735 (Smith, 1735), and by 1744 had changed to the Plume of Feathers Tavern in Castle Street (Spratt, 1744). This number was erased, 5 November 1801. A new warrant was issued 9 June 1808 to CORK under the title ‘St Patrick’s Lodge’. The warrant was cancelled 6 July 1826 and restored almost two years later, on 7 February 1828. A duplicate warrant was issued 16 March 1843, it being noted ‘the old one [is] lost’. In 1997, on the cancelling of ‘St Fin Barre’s Lodge’ No. 209, a compromise was reached in that the title of No. 209 was transferred to the lower number, No. 8, and ‘St Fin Barre’s Lodge No. 8’ was formed when the members united under that title.